According to the statista.com, the revenue of Fitness segment amounts to US$16,857m in 2019. It is also expected that by 2023, an annual growth rate of 5.0%, resulting in a market volume of US$20,499m. As of May 2018, Fitbit was ranked first with 27.4 million unique U.S. users, where MyFitnessPal, S Health, and Weight Watchers was ranked second, third, and fourth with 19.1, 14.9, and 3.7 million unique users respectively. This statistic shows that users are spending around 1% of the smartphone usage on health and fitness apps. Increase in usage of health and fitness apps results in an increase in revenue of wearable device. 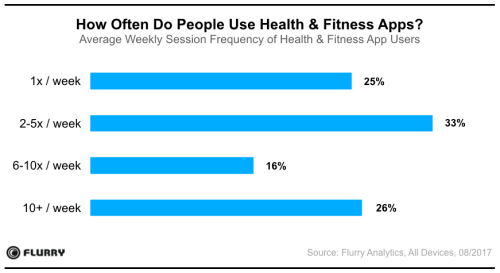 In fact, Flurry data also shows that 96% of active users are using only one health & fitness apps. Once, users start using the application, they are dedicated to their fitness apps and thus, it shows the highest retention rates across all categories available under Google Play Store and Apple Store. Check out below the graph to see how often people use health and fitness apps. As shown in the figure, the frequency of app usage increases overall category engagement and thus, it drives up the opportunity for mobile app developers to capitalize on users’ frequent engagement and increase monetization. Do you know MyFitnessPal’s users have lost over 200 million pounds? MyFitnessPal is one of the most demanded health and fitness applications that helps its users to lose weight, change their eating habits, stay healthy and start to implement a new dieting plan. Available for both Android and iOS users, MyFitnessPal helps 88% of people, who track for at least 7 days, to lose weight. 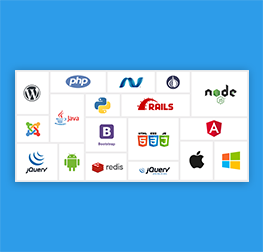 This application has a wide range of database that contains thousands of dishes and products. What’s make this app popular is its calorie counting feature. This feature will let its users set the right goals with a graph that displays day/week/month-wise progress. In addition, barcode scanner and recipe importer are some appealing features of this app that encourage users to download it. 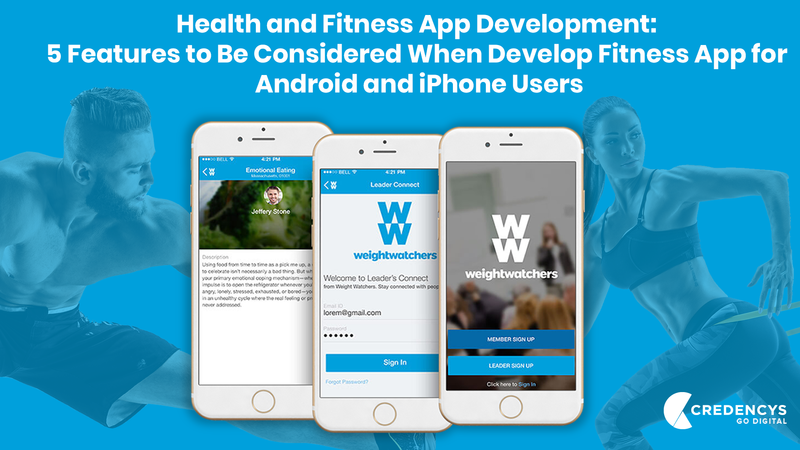 Weight Watchers is another popular health and fitness application that motivates its users to achieve a healthy lifestyle. With this application, users track their weight loss, fitness, and food. 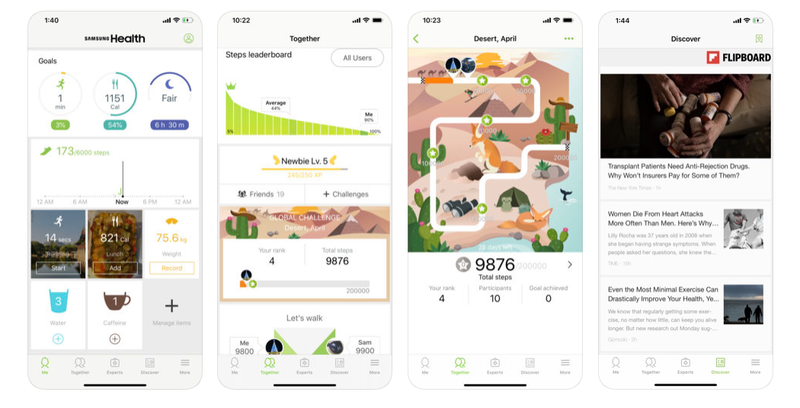 This health and fitness app also has a social community where users connect with their fellow members, share their inspiring stores and healthy habits. Weight Watchers app also has a feature of inviting and referring friends from voting polls, forums, personal contacts, message boards, group chats, and so on. One of the amazing and most demanded application, Fitbit is designed to work with Fitbit activity trackers and smart scales. Compete with buddies with daily or weekly challenges and compare it. Count calories consumed and manage weight over time, and so on. 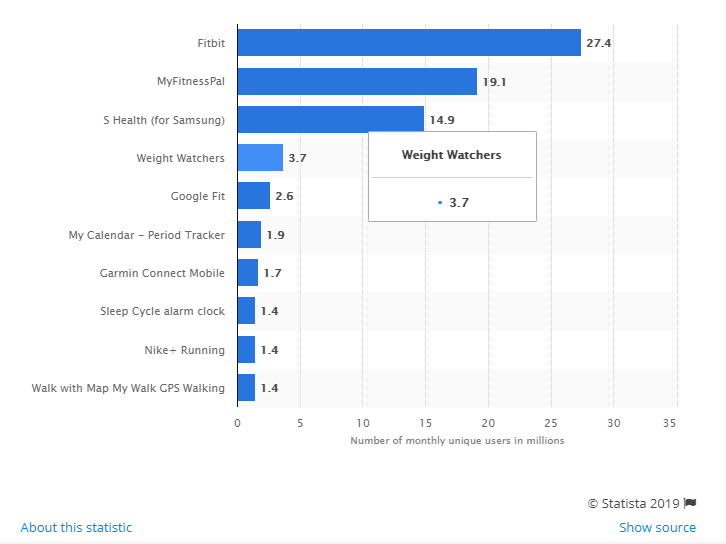 Samsung Health app is another popular health and fitness application that doesn’t require any wearable, as the app itself is capable of tracking steps and guessing how long user slept. This amazing application record and analyze user’s daily habits and activities that help the user to maintain a healthy lifestyle. Using built-in trackers, users can easily add and track different physical activities and exercise in a single step. S Health easily manages health and environmental records like weight & SpO₂, blood glucose levels, heart rate, blood pressure, stress by using built-in sensors and third-party devices. The most important feature, Geolocation, enables users to track walk routes, plan routes, and report workouts of the users. It uses a map to track the location and that location can be shared on various social media platforms. Barcode scanner is another important and useful function that simplifies the process of logging food. It scans the barcode with your smartphone and provides all the necessary data related to ingredients and calories. This feature is integrated into one of the popular application, MyFitnessPal, used by 19.1 million users in USA. It would be great to connect an application with trackers to support wearables. It is suggested to use Apple’s HealthKit or Google Fit for storage and other wearable manufacturers’ APIs to connect devices in health and fitness application. With Fitbit API, fitness app development company can able to interact with Fitbit data in its’ own apps. 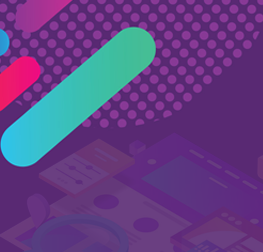 Jawbone UP open-source platform delivers a set of SDKs and APIs to build to fitness application and to connect hardware products to the platform. Garmin platform provides tools to develop an app for Garmin wearable devices. Gamification is the motivated feature to integrate into health and fitness application. This feature is integrated into RunKeeper or Nike+ application that entertains and inspires a person when he/she accomplish the goals. One can add gamification by including many interesting tasks that users have to complete. If users fail, he/she would lead to penalties like five crunches or pushups or anything. Being a fitness enthusiast, you would never want to miss any session, right? But sometimes, you wouldn’t remember. In that case, Push notification helps you to remind your workout session. Many health and fitness app development companies are investing in integrating notification system, as it helps them to remind about workout session and for business, it helps to increase revenue by notifying users about an upcoming workout. How much does it cost to develop a health and fitness app? It’s really difficult to tell the exact health and fitness app development cost without knowing the clear terms, features, and functionality you want to integrate. The cost of totally depends on the application type and its difficulty. To know the estimate of health and fitness app development, it includes development time and a number of developers involved in the project. An average health and fitness development time start from four-six months. However, the project time depends on various factors like targeted platforms, app’s feature and type of application. How to Make Money from Health and Fitness App? There are uncountable ways to monetize health and fitness application. It is best to make a free application, and then, offers additionally features in the paid version. 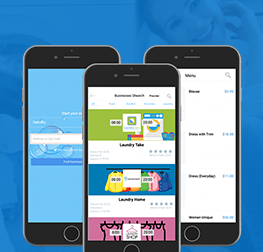 Nowadays, app owners are offering basic functions in a free version and some advanced features with paid membership. 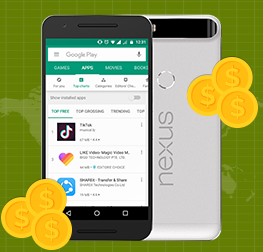 Another popular way to monetize your application is by placing an advertisement, however, you have to be careful as many people find ads distracting and annoying. If you have health and fitness app development idea and want to convert it into a successful application, then contact Credencys, as we are reliable mobile app Development Company in USA, offering the best team of mobile app developers, who have experienced in developing health and fitness app like Weight Watchers.